Prior to Season 7, “Veep” dealt with Donald Trump offscreen instead of dealing with him onscreen. 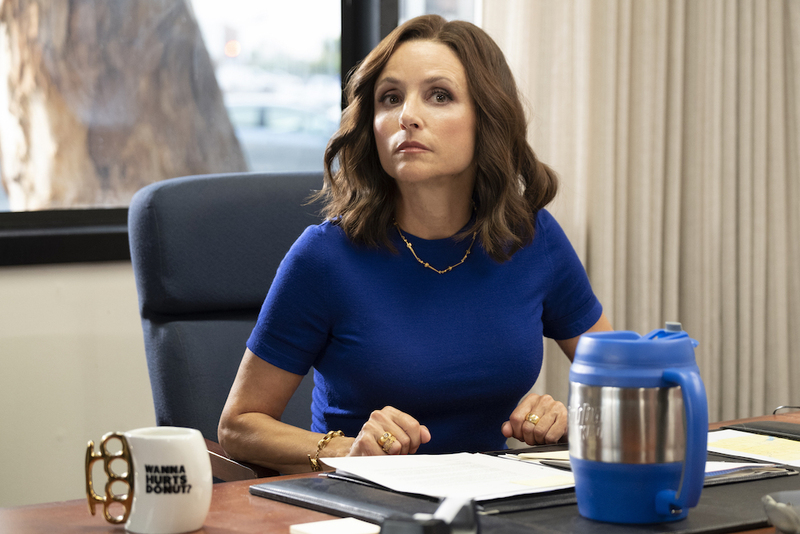 Executive producers David Mandel and Julia Louis-Dreyfus fielded repeated questions about how the 2016 election’s unexpected results would affect the political satire, and they repeatedly said, in short, it wouldn’t. It couldn’t. Not yet. But now it can. This is the first season written after Trump was elected president, and the third episode of the season drills home one of “Veep’s” most prominent points about America under his tenure: Politicians may be awful, but the people are to blame. It’s a pivotal choice and turning point for a series that’s always skewered our nation’s leaders before its citizens, so let’s look at the framing of “Pledge.” Directed by Morgan Sackett and written by Rachel Axler (both “Veep” veterans since Mandel’s team took over in 2016), the episode opens with 2020 presidential candidate Kemi Talbot (played by Toks Olagundoye) addressing a throng of supporters at an Iowan campaign rally. Fans hold up signs like “She’s got Kemistry!” and “Kemi = Hope.” Her colors are white lettering against soft blue backgrounds with red piping. All of it, down to the way she speaks — in a slow, precise, some might say comforting manner — evokes the former president, Barack Obama, who ran under a banner of hope. But she’s not an Obama surrogate because she’s not from a past era. She represents the future of politics — an idealized future, that is. For one, she’s a woman, and she’s not shy about reminding voters of it. She starts the episode by saying “as a woman and a woman of color.” Kemi is multiracial (or, as Selina rudely refers to her, “tri-ethnic,” implying black, white, and Hispanic backgrounds) and a relatively young Senator. The first point further angers Selina (Louis-Dreyfus), who doesn’t want to share the spotlight with another woman, but it’s the second one that gets to her because she can’t claim it for herself. She’s white, she’s old(er), and progressive-minded voters are looking beyond older white candidates now. These traits, as well as her demeanor, help make Kemi an attractive candidate to smart, young voters — like Catherine (Sarah Sutherland) and Marjorie (Clea DuVall). The applause takes Selina off guard. She keeps speaking, catching herself to let the people voice their approval, and then plays to the audience by repeating the slogan she’s stumbled into: “Man up!” Is she arguing that more women should shut up and take the abuse doled out by men? Is she using outdated slang to tell a younger woman she doesn’t have it as bad as Selina did, so stop complaining? Is she arguing for inequality while playing to the audience’s grumpy old man anger? Who cares? They love her for it, and that’s all that matters to this candidate. In a way, Selina Meyer is the perfect representative of misguided rage; the same anger that Trump riled up in the middle Americans who voted him into office is the anger she feels for being passed over in politics. While some 2016 voters felt the world was moving on without them, Trump made promises to make them feel relevant again — to bring coal mines back to fruition and manufacturing jobs back to America. Selina, meanwhile, caters to that same mindset by turning back the clock and telling these kids to stop whining. She’s tapping into the same latent rage “the hillbilly tide” is feeling (as Dan puts it), and she can do so rather easily since she’s pissed off, too. It’s easy to imagine Trump’s constituents using “Man up!” as a rallying cry, but the truly savvy move in “Pledge” is that it gut-checks non-constituents, too. Kemi is beyond great. She’s been crafted in a lab (aka a writers’ room) to be the perfect candidate, and yet the room shifting to Selina is totally believable. “God bless America — for hating women almost as much as I do,” Selina tells Ben (Kevin Dunn) after the debate. It’s a point that hits home (like so many “Veep” lines) almost a little too hard. That’s the secret Selina tapped into at the debate, and it’s scary how easy it is to go along with her passion. Despite evidence to the contrary, we can’t help but respond to Selina. We can all identify what makes her a bad person, and it goes without saying she’s a terrible public servant. (I don’t even think she could say those words out loud.) But Selina’s rage carries with it just enough instinctual, undeveloped logic to make it convincing. If just for a second, you consider whether she has a point. Could it be that simple? Are we all just complaining too much? Should we just be tougher people? Sure, after you give it a few seconds thought, all the flaws become clear. But maybe by then you’re already clapping. Maybe you’re already caught up in the moment. Maybe you just caught a sliver of what it’s like to think like a Trump supporter, and that’s how “Veep” is dealing with Trump: All politicians are awful, but even if there’s a good one, the people will find a way to ignore her. “Veep” airs new episodes Sundays at 10:30 p.m. on HBO.